You might remember that on 21st March just 10 days ago I planted 3 short lengths of sugar cane which I had bought in Madeira. You can see that on the joints there are some little shoots. Well, look what's happened just 10 days later! I wasn't dreaming that I would get any sort of result, let alone this quickly. I placed this seed tray full of well drained compost in my heated seed propagator in the greenhouse! Exciting stuff! Watch this space! The Peach Blossom in the fruit garden at RHS Wisley is looking fantastic. I went to the RHS Grow Your Own weekend at RHS Wisley yesterday. To be honest I was a bit disappointed. Just a few staff on a bit of field showing you how to dig, how to plant potatoes and how to plant a tree. Then in the model vegetable garden there was a glum looking gardener with a cowboy hat answering questions. No tents, no exhibition, no stalls, no market, no shopping.. it was widely advertised, and if 70% of all seeds now sold are vegetable seeds, I was expecting more! So I went for a lovely walk elsewhere in the gardens. Peaches grown in the UK have to be kept fairly dry during Winter to protect them from moisture, so they are mostly grown under glass, or protected from the rain with a plastic sheet. A plastic polytunnel shows what hardy Winter leaves you can grow with just a little protection, cabbage, spinach, salad leaves. Garlic was looking good in the model vegetable garden. And I visited an old friend, the fruit orchard. I've never visited this time of year before, normally the trees are laden with fruit and you can't see from one end of the orchard to the other. It was just like meeting an old friend whom you know well... but naked! 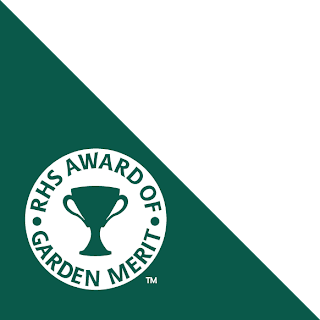 The Royal Horticultural Society has designed a new Logo for the Award of Garden Merit. I find this award very useful when choosing a particular variety of vegetable. Plants are grown as part of a trial at one of the RHS sites and are judged by a panel of experts. I remember a couple of years ago there was an RHS trial of Runner Beans. Dozens of different runner bean varieties were grown side by side, in identical conditions. The judges attend and look at the whole plant, decides how prolific it is, how resistant to disease it is, how easy it is to grow, how tender and tasty the finished product is. * It must not be subject to an unreasonable degree of reversion in its vegetative or floral characteristics. So next time you are going through a seed catalogue trying to choose a new variety, I have found the RHS AGM to be a good recommendation. cutting them down to size..
and just lazing around being cute. Actually, for the rest of the afternoon Leo brought most of his toys out of the house and down the end of the garden, then he fell asleep on the lawn in the sunshine. A perfect garden helper! Matron loves to try growing new and exotic things on her patch! Well, I couldn't resist buying a length of sugar cane in the market and giving it a go!. I have heard that it is possible to grow sugar cane in a pot in a greenhouse here, so I looked up the cultivation instructions on the internet. On this piece, at each joint there happens to be a little new shoot already. 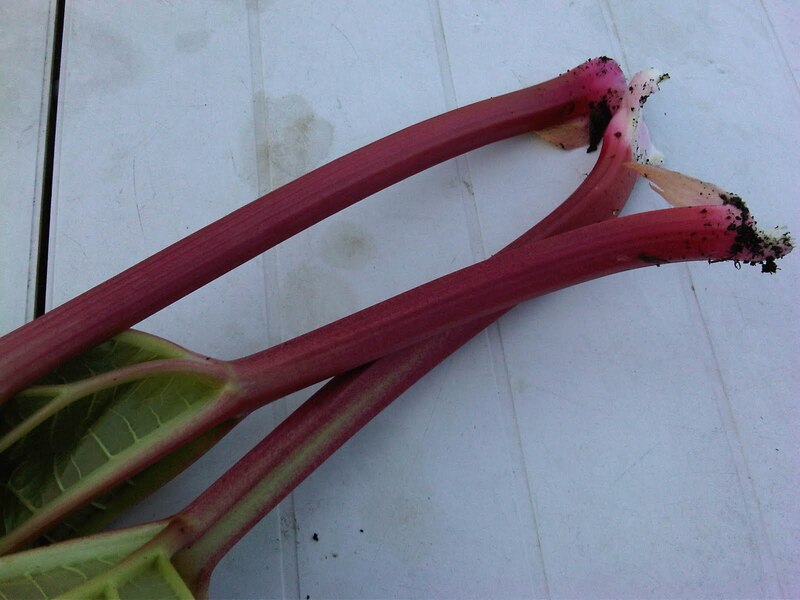 Cultivation instructions suggest cutting the cane into lengths which contain 2 or 3 shoots. 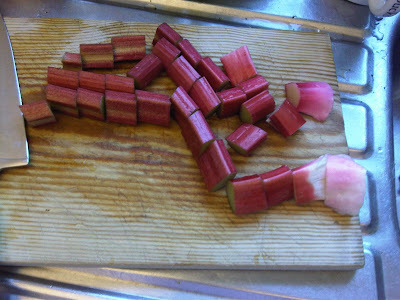 So I cut the cane with a saw, and soaked them in water for several hours. Apparently they are sown on their sides where the new shoots grow up vertically. So I covered them in some seed compost with some vermiculite to ensure good drainage, and I have left them covered up in a heated propagator in the greenhouse. Watch this space. Well it really was a case of too much to do and too little time to do it! Just a couple of days in Madeira wasn't enough. One of my favourite places in the world is the fruit and veg market in Funchal. Baskets of locally grown exotic fruit and veg just waiting to be eaten. These custard apples are just a world away from the hard green efforts that you can sometimes buy here. All the fruit in Madeira is ripe and sweet and out of this world! After all that shopping Matron just had to put her feet up for a while, sip some Madeira wine and watch the ships sail into the harbour! I had time to fit in a helecopter flight round the island too! Matron just loves helecopters! I have always called this the 'Labrador Market' but the Mercado dos Lavradores is the Portugese name for the main market in Funchal. Leo pricked up his ears when I told him there was a Labrador market in Madeira! Though Matron did make a few friends among the strays walking the streets out there! A trip to the Botanical Garden was fascinating, alongside the flowers (Matron does not do flowers) there was an edible garden. Amazing to see how coffee, bananas, guavas and sugar cane grow. I managed to bring back a length of sugar cane which I will attempt to grow in a pot in the greenhouse. Bob Flowerdew has managed it, so Matron will humbly follow in his footsteps and have a go! More later! 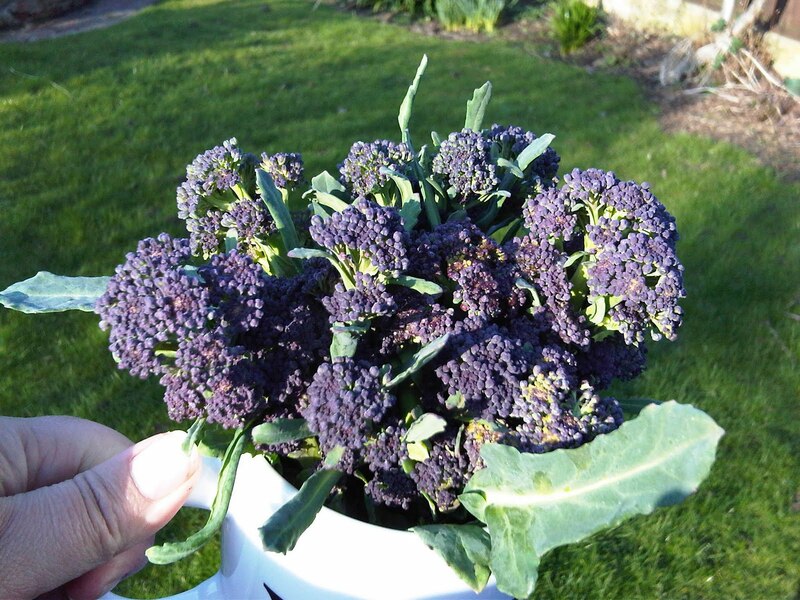 By all accounts I am lucky to have purple sprouting broccoli this year. The cold Winter seems to have devastated the commercial crops but a few of my early PSB 'Rudolph' have done quite well. This is one of the better shows, early pickings like this are tender and tasty. Leave them a few weeks more and they can become fibrous and chewy. I will certainly leave one of the plants to flower because the bees just adore PSB flowers! If you get a chance to let any of your brassicas go to flower then please do! You will encourage the bees to come and pollinate the rest of your patch. My Bishop's Kiss chilli are continuing to grow nicely in the heated propagator in the greenhouse. They need such a long growing season they are one of the few things that has to be planted this early. I am probably going to plant a few tomato seeds next week. Another little experiment in Matron's greenhouse is this first early new potato 'Rocket'. I planted it in a pot in the heated propagator a few weeks ago. I will keep re-potting it and I hope to have an early crop of new potatoes at Easter! Just about the time when the seed potatoes will be going in the ground outdoors! The traditional time to plant new potatoes according to the garden calendar is Good Friday! Matron is off to the sunny island of Madeira for a couple of days sunshine and luxury. Baxoon! This blog is supposed to be about growing veggies, but I know you will forgive a little indulgence. Leo was a stray! someone left him on the streets of London and didn't bother to look for him. Aside from a little arthritis in his joints he is still full of life! Like all Labradors, Leo loves his food - so getting him to eat his veggies will not be a problem! This is Leo! Need I say more? Leo came home today. 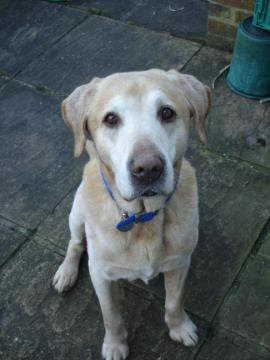 11 year old Labrador that someone else didn't want - can you imagine that? I'm sure you will be hearing more from him as he settles into his new home. What a lucky boy! The sun was shining today. But I still had to scrape the ice off my car windscreen this morning so there is no warmth in it yet. Never mind! The days are getting longer and the veggies are responding to it. Just look at this lovely first crop of Purple Sprouting Broccoli. Tender and sweet - I steamed it while it was still squealing! Delicious. My Rhubarb is just going crazy at the moment! I didn't force it in the dark, I think it is just so full of energy because of the long, cold Winter which it must have enjoyed! Like the broccoli, the first pickings of the season are tender, sweet and full of flavour! Just 5 minutes with a spoon of sugar in the microwave. Heaven!